Classified by the International Union for Conservation of Nature as an endangered species, the graceful Eld’s deer (Rucervus eldii) is indigenous to the dry forests of Southeast Asia. However, decades of habitat loss have dramatically reduced its numbers to a point where only small, scattered populations exist across parts of India, Myanmar, China, Cambodia, Vietnam and Laos. Indeed, 50% of the world’s Eld’s deer have disappeared in the past 15 years alone. In Laos, the only known home for this mammal occurs within the 93,000 ha Savannakhet Eld’s deer sanctuary, where there are an estimated 60-80 individuals. Threats to the ecological integrity of the landscape in which the Eld’s deer sanctuary is located are escalating. Of particular concern is rapid habitat conversion of the dry forest it lives in to make way for a high-intensity agriculture. Habitat conversion and unsustainable land use is largely driven by poor planning. Often communities encroach upon the forest, burning vegetation to create livestock fodder. 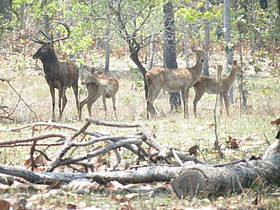 By doing this, the area in which Eld’s deer is free to live and breed is reduced, ultimately meaning a drop in numbers. To address this, WWF-Laos, in collaboration with the provincial, district and village authorities, is assisting in land use planning, villager-led patrolling of the sanctuary, and the development of sustainable livelihood opportunities to reduce impacts to the deer and its habitat. With better locally directed measures to conserve the dry forest Eld’s deer calls home, we are hopeful this magnificent species begins to flourish once again. This medium-sized deer has a regal and graceful physique. Its legs are thin and long with a long body, large head and thin neck. The rough and coarse coat turns from reddish brown in summer to dark brown in winter.